Heat oven to 450°F. 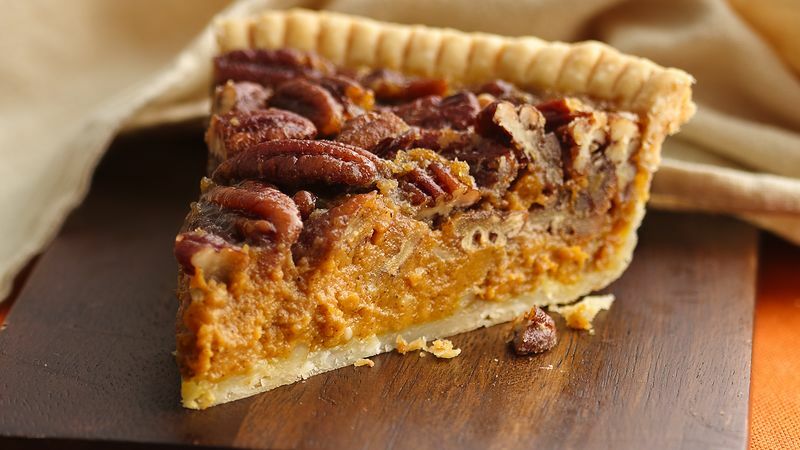 Sprinkle both sides of pie crust with 1/2 teaspoon flour; smooth flour over crust. Place crust in 9-inch glass pie plate. Carefully line pastry with double thickness of foil, gently pressing foil to bottom and side of pastry. Let foil extend over edge to prevent excessive browning. Bake 10 minutes. Carefully remove foil; bake 3 to 4 minutes longer or until pastry begins to brown and has become set. Reduce oven temperature to 350°F. In medium bowl, beat all pumpkin filling ingredients with whisk until blended. Pour filling into partially baked crust. In another medium bowl, beat all pecan filling ingredients except pecans with whisk until blended. Stir in pecans. Carefully spoon mixture over pumpkin layer. Bake 30 to 35 minutes or until knife inserted 1 inch from edge comes out clean. Cool completely on cooling rack, about 2 hours. Store covered in refrigerator. To make your own pumpkin pie spice, combine these ground spices: 4 teaspoons cinnamon, 1 teaspoon ginger, 1/2 teaspoon allspice, 1/2 teaspoon nutmeg and 1/2 teaspoon cloves. Store in a tightly sealed container. Use what you need for this recipe and store the remainder in a tightly sealed container. Sprinkling flour on the pie crust ensures a well-baked crust for moist pies.